Canon Pixma MX435 is an all-in-one printer designed to fulfill almost all the requirements of small office users and home users. It offers you high-quality outputs for its all functions including printing, copying, and scanning with its high yield Canon Pixma MX435 ink cartridges. The printer weighs approximately 8.5 kgs and measures 458 x 385 x 200 mm. With a built-in Wi-Fi, 30-sheets ADF, CIS colour scanner, LCD screen, super G3 fax mode, this multifunctional device brings versatility to small office users as well as to home users. This device allows direct scanning to USB drives and even to e-mail and network folders. his compact inkjet printer looks similar to other Canon Pixma MX versions but offers more functionality with its high-end features. This unit helps in carrying out an impressive array of tasks, although the print speed remains its weakest point. Canon Pixma MX435 isn’t the fastest printer around but offers good performance and great quality prints with its high yield Canon Pixma MX435 ink cartridges. Its range of advanced features like Wi-Fi connectivity, super G3 fax mode, CIS scanner, and ADF make it an effective standalone device for small office users as well as home users. With direct scanning to USB memory and even to e-mail and network folders, this inkjet printer ensures good flexibility to the work. Compared to other MX versions, this compact inkjet printer has a low printing speed but it proves to be an ideal addition to any office setting. Q. I recently bought Canon PG540XL ink cartridges as I need good supplies for extensive printing jobs in black. I’d like to know what other advantages they offer and how economical these Canon Pixma MX435 ink cartridges are. A. These are premium ink cartridges that have been developed to yield high quality results while printing text documents as well as graphics. They are ideal for home use also and can be relied upon to print a lot more than what you pay for; compatible cartridges cost lesser and give the same yield if not more as they are made from recycled material, which reduces costs for the third party manufacturers.. These ink cartridges have 21ml of ink, are easy to replace and handle and also kind to the environment so would be ideal for you. Q. How many days would you please give to me for returning Canon Pixma MX435 ink cartridges that I purchased last week? I placed a wrong order and need another model. I haven’t opened the cartridges. Thanks. A. We give 30 days for returning the items but you don’t require. You may initiate the returns process at your earliest convenience. Since you haven’t opened the packaging, returns will be even quicker and convenient. Q. I purchased compatible Canon Pixma MX435 ink cartridges from you and am satisfied with the quality, services and attractive costs. However, I feel concerned whether using compatible cartridges regularly can have any adverse impact on the printer. A. Glad to know that your experience with our compatibles is positive and that you are saving a considerable amount too. About the effect that compatibles may have on your printer, we’d like to say that no such issue has been raised so far. Compatible cartridges are recycled and restocked with new ingredients by third party. They are produced using the best technology and launched only after testing them well. Q. Is the ink capacity of compatible Canon Pixma MX435 ink cartridges more than that that of original cartridges? A. Yes, it is, so you print more and spend less when you use compatible ink cartridges. Q. Do compatible Canon Pixma MX435 ink cartridges (PG-540XL) print more than 500 pages in black? A. Yes, these ink cartridges in fact print up to 600 pages in black. Q. Are compatible Canon Pixma MX435 ink cartridges easy to install? I have always used the genuine ink cartridges, which I can install but didn’t feel too sure about the compatible ones. A. You’ll find installing compatible ink cartridges very easy too as they are installed in the same way as the genuine cartridges. Q. 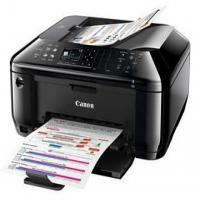 Can I print on glossy photo paper with Canon Pixma MX435 ink cartridges installed in my computer? A. Yes, these ink cartridges print excellent quality images and text on glossy photo paper too. Q. How are refilled cartridges made? A. Refilled cartridges are basically original empty cartridges which have been used once. We collect these ink cartridges and send them to factories for recycling where they are cleaned, put through recycling process and then repackaged. The ink cartridges are then filled with premium quality ink that match the ISO standards of the ink cartridges of the respective original brand. Q. Are Canon Pixma MX435 ink cartridges known to guarantee fade-resistant and smudge-free printing? Can I use them to print on A4 size pages? A. Yes, you can count on them to print fade-resistant images and texts without any smudges. They can be used to print on A4 size pages. Q. I bought a multipack of Canon Pixma MX435 ink cartridges but don’t need to use one of the colour ink cartridges right now. Can I use it later after some months or will it go unused? A. It’s perfectly fine if you cannot use one or even more of the ink cartridges in the multipack you bought. You can keep them packed and store them for up to six months and be sure they will be in perfect working condition till then. Q. My Canon Pixma MX435 is blinking orange light 6- 7 times. What does it mean? How to solve the concerned problem? A. Blinking of orange light 6-7 times in your printer indicates that more than one Canon Pixma MX435 ink cartridges of the same colour are installed. For this, you need to check for the duplicate coloured ink cartridge by lifting the printer cover. Remove and replace the cartridge with the correct one.If the problem persists you need to take your printer to authorized repair center. Q. Do you have cartridge pack for Canon Pixma MX435? How do you deliver it? Premium Remanufactured Canon PG540XL Black x1, CL541XL Colour x1 ink cartridges. Remanufactured Canon PG540XL high capacity premium black ink cartridge. Remanufactured Canon CL541XL high capacity premium ink cartridge. All our orders are delivered by Fastway Courier which take standard delivery time of 1-2 working days. Q. The back of the paper gets smudged from the printouts of my Canon Pixma MX435. What should I do? Should I replace my printer cartridges? A. It may be because when we perform borderless printing, duplex printing or too much printing the inside may become stained with ink.You need not replace your Canon Pixma MX435 ink cartridges. To resolve this make sure that you do not perform any other operations while bottom plate cleaning. Turn on the power and remove any paper from the tray. Load this sheet of the paper in the front tray with the ridges of the creases facing up and the edge of the half with no crease facing away from you. Open the output tray extension followed by output tray and then output support. Clean the inside of the machine by pressing the Setup button and use arrow keys to select maintenance option by clicking on the Ok button. Use arrow keys to select Bottom cleaning option by clicking on Ok. In case if the problem persists after continues cleaning of the bottom plate then performs cleaning of the Protrusions inside the machine. Q. I want to buy compatible cartridges for my Canon Pixma MX435. Do you sell refilled or recycled cartridges? A. We sell recycled and remanufactured Canon Pixma MX435 ink cartridges.The recycling process involves replacing damaged parts and make sure that the cartridges function properly. Q. I am planning to buy cartridges for my Canon Pixma MX435. How do I order them? What if I don’t get my order? A. You can buy Canon Pixma MX435 ink cartridges from our website by simply searching the printer model in the search bar. You will get a list of the ink original as well as compatible cartridges that will work with your printer.You can place the order after selecting the cartridges and placing them in the cart.We deliver our orders by Fastway Courier.They attempt two delivery at your doorstep and return the order to our warehouse.After which if you can either reorder your cartridges or take a refund according to our policy. Q. My Canon Pixma MX435 printer stops supplying ink to the paper and cannot print to End of Job. What is wrong with my printer or cartridges? A. There is no issue with your Canon Pixma MX435 ink cartridges.You just need to check if the size of the printing data is extremely large or there is sufficient space on your computer’s hard disk. To check the size of the print data click on the Print option on the Page Setup sheet in the printer driver then set( prevention of data loss ) in the displayed dialog to ON.